During Remember A Charity Week 2018, we saw countless examples of charities using innovative and creative ways to engage their supporters with the concept of legacy giving. Taking part in Remember A Charity Week for the first time this year, the Birmingham Hippodrome shone a spotlight on legacies, projecting campaign imagery from the heart of the venue. The charity went all out on social media, giving #10ReasonsWhy legacies make such a difference to the charity. Personal viewpoints from the Chief Executive, Trustees, Artistic Directors and supporters conveyed the importance of legacies to the charity. As a vibrant theatre with thousands passing through its doors each week and over 49,000 Twitter followers, this was a great way to get the legacy conversation started. So many charities displayed the campaign widely on social media, online and by email, reaching thousands of new supporters to convey the importance of gifts in Wills. Shelter also took the message out on the street, briefing its face-to-face teams and charity shop staff and volunteers to talk about legacies and hand out relevant information. In this honest and heartfelt video from the charity’s Chief Executive Polly Neate, Shelter conveys the transformative impact of charitable bequests for the families it works with. And using Remember A Charity’s Human Search Engine, Shelter encouraged the public to consider how we can build a future without homelessness. As part of #RememberACharityWeek we were asked ‘How can we build a future without homelessness?’. Within the charity itself, a game of ‘pass the parcel’ was played with legacy information included in every layer, conveying how a legacy enables people to pass on something truly wonderful. Recognising the strength of its imagery, Royal Museums Greenwich shared stories and pictures on social channels of artwork that have been gifted to the museum over time, like this family portrait featuring Captain Richard Grindall who entered the Navy and fought during the War of American Independence, the French Revolutionary War and the Battle of Trafalgar. The museum encouraged the pubic to think about what they would pass on. Captain Richard Grindall entered the Navy aged 21. He saw action during the War of American Independence, the French Revolutionary War and the Battle of Trafalgar. 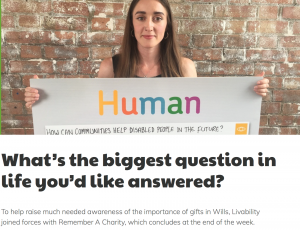 Displaying campaign materials widely during the week, Livability took the opportunity to introduce a new toolkit on legacies for staff and volunteers, helping build confidence among the charity’s staff and volunteers for talking about gifts in Wills with supporters. The charity’s legacy marketing manager, Katrina Emerson, also shared her tips with others in the sector for engaging with supporters about legacies online at Civil Society. And let’s not forget Gladstone, the Treasury cat with over 30,000 followers, who took this opportunity to remind us all of his origins and love for Battersea.